Vacationers flock to Siesta Key for its peaceful beaches, tranquil waters, and stunning views from nearly every vantage point. The next time you find yourself on this tropical island, be sure to hit up one of these spots to catch a stunning view you’ll never forget. Every inch of the Siesta Key public beach provides an idyllic view of the water. However, for the best possible view, try to snag a spot between lifeguard stands three and four. Not only will you have a great look at the sun slipping behind the horizon and reflecting on the aqua abyss, but you’ll also be treated to an array of drummers. The whole display is magical and will make you feel like you’ve been transported to a different dimension. If you’re hungry and want a good view to accompany your meal, you’ve got to check out Dry Dock Waterfront Grill. With a huge open patio right next to the docks, the restaurant offers stunning views with a casual vibe. For an even better glimpse of the surrounding area, head up the second floor to the panoramic dining room. Three walls of windows give you the chance to see the entire Sarasota Bay. Stop by during sunset to sip cocktails and watch the sky transform into an orange and pink masterpiece. Located south of Siesta Beach is Crescent Beach. It’s a bit calmer than the public beach because you can only gain access if you’re staying at a resort or condominium along the shore. Otherwise, you’ll have to park at Siesta Beach and walk your way down. One of the best areas for a view on Crescent Beach is Point of Rocks, which is a rocky region best known for its snorkeling and diving. However, you don’t need to go under the water to appreciate the natural beauty of the shore. Watch the tide recede and rise as the sun disappears and the moon takes its place in the sky. Even further south is Turtle Beach, which is a region known for its coarser sand and steeper ocean drop-offs. However, the deeper waters provide a richer blue that contrasts more sharply with the setting sun. For the best view in this area, head to Ophelia’s on the Bay. This is another restaurant that focuses on a fine dining experience. The venue offers two glass walled dining rooms as well as an open air patio to give you unwavering views of all that Little Sarasota Bay has to offer. With 8 miles of island to peruse, you’ll have no trouble finding a good place to watch the sunset, sunrise, or sparkling water on Siesta Key. 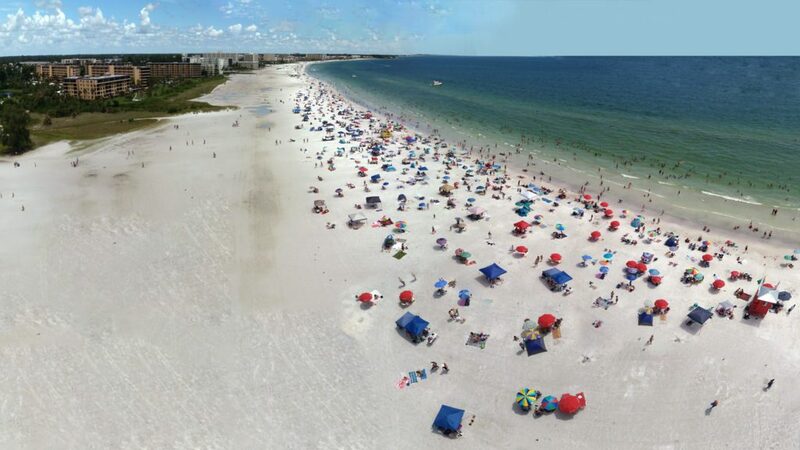 One more wonderful way to get a killer view is to book Siesta Key hotels right on the water with Hotel Planner. This ensures you’ll have a great view from the time you wake up in the morning to when you go to sleep each night.